An international organization dedicated to the creation and dissemination of knowledge in the area of public law, with 17 countries, 4 public authorities and 71 universities and institutions participating in its Board of Directors. 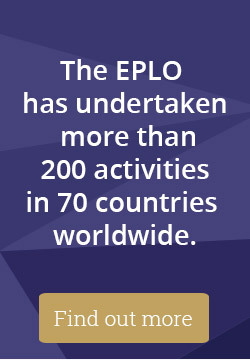 The EPLO is an international organization dedicated to the creation and dissemination of knowledge in the area of public law lato sensu, including but not limited to inter alia national, comparative and European public law, human rights law and environmental law for a better generation of lawyers and democratic institutions worldwide. By cooperating with the European Commission and other international organizations such as the United Nations and the World Bank, as well as being a member of EUNIDA and IACA, the EPLO has carried out extensive research and consulting activities. It has also developed, organized, and supported around 200 educational, research, training, institution building and other activities and has provided assistance to democratic institutions in more than 70 countries around the world. The work of the EPLO focuses on four pillars, each one perpetually contributing to the improvement of the others through an integrative approach. 1. Research: Explores policy alternatives and provides technical legal advice to national authorities. 2. Education and Training: Shares, accumulates & advances the intellectual capital required for the development of legal systems and transfers the know-how in a train-the-trainers approach. The EPLO has established high caliber educational agencies & programs addressed to graduates and practitioners, enabling them to enhance their knowledge and promote their career in a flexible and time-saving way. In addition to the “The Academy of European Public Law”, the EPLO implements the following programs: the “Academy of Transparency and Human Rights”(http://athr.eplo.eu), the “European Institute of Management”, the “Training Institute for Law & Governance” (http://lawtraining.eplo.eu) and the “Global Law & Governance Summer School” (www.glgss.eu). 3. Institution Building – Technical Cooperation: implements a large number of technical cooperation projects which assist governments and institutions all over the world in promoting human rights, the rule of law, democratization processes, law enforcement, public administration reform and sustainable development law.